Modern architectural designs often require glazing materials that provide higher levels of security and safety performance, such as resistance to ballistics, blasts, hurricane/circular wind pressures and physical attack. In general when we talk about ballistic glass protection, laminated glass pops first to our mind. This consists of a minimum of two sheets of glass bonded together with an interlayer. Different combinations of pane size and the number of sheets combined with the interlayer give us different impact resistant effects. 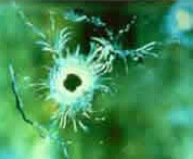 The typical combination used in bullet-resistant glass consists of multiple plies of thinner glass, less than 12 mm, separated by thin layers (0.38 mm) of interlayer. There are several methods and tests to determine the rating of a ballistic-resistant product. One of those methods is the Underwriters Laboratory (UL) 752 test method. The UL-rated levels 1, 2 and 3 can resist a bullet fired from .9 mm, .357 magnum and .44 magnum weapons. The higher UL level from 4 to 8 are typically applied to government and military applications. For added protection in security glazing applications, glass industry offers laminated polycarbonate sheet for enhanced strength and impact features. Polycarbonate plastic is a lightweight, high-performance plastic found in commonly used items such as automobiles, cell phones, computers and other business equipment, sporting goods, The tough, durable and heat-resistant material is perfect for a lot of applications and is found in thousands of everyday products. Bullet-resistant laminates consist of multiple pieces of glass with a polycarbonate spall plate bonded together by inter layers of polyvinyl butyral or aliphatic urethane. These laminates can resist bullet penetration from a variety of small arms and rifles. This monolithic construction provides an invisible protection.